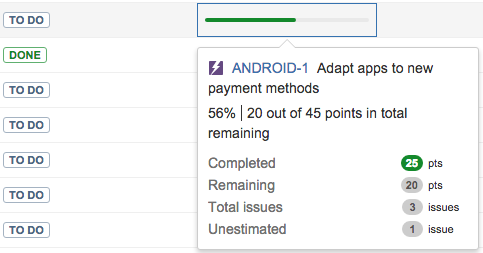 You can track the progress of issues in your JIRA application directly from your plan in Portfolio for JIRA. If issues are estimated in hours or days, Portfolio for JIRA will use time-based progress tracking. If issues are estimated in story points, point-based aggregation will be used. If you connect to boards and projects that have different plan units, Portfolio for JIRA will let you choose the estimation unit to use when you're creating the plan. If you leave your issues unestimated, progress will be calculated based on issue resolution, as well as the progress of child issues, if any. Once your plan is created, a progress bar is displayed for individual issues. Parent issues will display an aggregated progress bar, corresponding to the individual progress of all the child issues. 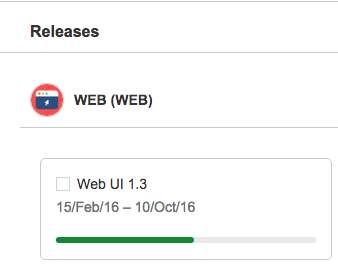 You can also check the progress of releases in the release view. The progress status bar shows the unestimated issues in relation to items that are estimated. This allows you to see the percentage of work done on estimated items as well as the issues that are still outstanding and require work. When a parent issue is expanded, the bar shows the total progress of all the child issues. Items with no progress are displayed as a faded grey line. Issues that are in progress show the completion percentage as a green line. Completed issues show a full green line. If an uncompleted child issue is part of a completed parent, Portfolio for JIRA will display a warning, indicating that the parent issue is already done — and therefore, the parent progress calculation won't take the children into account. Check out the progress tracking bar by selecting your plan > Scope and clicking the bar to see the details. Use the scope filters to sort by status, completion date, and schedule range. To see updated progress, make changes to the issues, and click Calculate. For an estimated epic with child issues that are not estimated, when you set the epic to done, or log work time for the epic, the progress bar of the child issues will also be updated accordingly. When a child issue is marked as completed, the progress bar of the the parent epic will reflect the progress, as well as the amount of completed points/time. You can also check the release progress by going to your plan > Releases. Manual assignments: The progress of issues contributes to the first release that's assigned to the issue. Automatic assignments: The progress of issues contributes to the last assigned release. The status filter is set to open and completed. Completed since filter is set to the desired timeframe. The issue has a resolution date that's set. Issue status is green. It is technically possible to have an issue status that is called "done", but is not in the green category. Filter used as issue source includes completed issues. Filters behind boards usually contain completed issues, but if you're using a custom filter as a source for a plan, you'll have to verify that the completed issue shows up when you run the same query in JIRA issue search. Issue has a fixVersion set and it's part of a plan in Portfolio for JIRA. If no remaining effort is set, the original estimate is considered, and the progress is aggregated up the hierarchy. When an issue is set to resolved, the bar will change to 100% complete. If the issues are not estimated, progress is calculated based on the issue’s resolution field and the progress of child issues. If an issue doesn't have child issues, and the issue is resolved (resolution field is not empty), the progress is 100%. Otherwise, the progress is 0%. The following fallback is used if your issues have no estimation. Progress is calculated based on the issue’s resolution field and the progress of child issues. If an issues doesn't have estimates, and the issue is resolved (resolution field is not empty), the progress is 100%. Otherwise, the progress is 0%.